According to new figures, planned marketing spend is at the highest rate for 6 years. 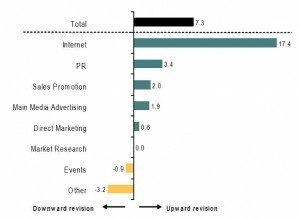 The latest IPA Bellwether report has been published this morning and shows a “sharp upward revision” in marketing budgets for Q2. 22% of firms have reported an increase in marketing spend during the last survey period, with 15% saying they’d be cutting back. This net balance of +7.3% is the highest since Q3 in 2007. “The second quarter is looking like one of the best we've seen since the onset of the financial crisis in terms of a positive signal for marketing budgets and the wider economy,” said Chris Williamson chief economist at Markit and author of the Bellwether report. “The latest Bellwether survey shows companies taking an increasingly aggressive stance with regard to boosting their marketing expenditure, which in turn reflects their views on financial prospects having improved dramatically over the course of the year to date. Marketing spend looks set to rise in 2013 for the first time in six years as companies finally perceive a brightening business outlook at home and abroad. Taking the whole year into account, there’s a net balance of +13.5% of companies pencilling in an increase in marketing spend. This is the most positive forecast in 2 years. “Companies are beginning to shake off the cloak of recession and are becoming more confident in the economy. This bodes extremely well for continued growth in marketing spend for the rest of 2013. These figures should send a very upbeat message to the wider economy,” added IPA director general, Paul Bainsfair. When broken down by sector, internet has proved to be the key driver in budget growth (+17.4%) and there are also positive net balances in PR (+3.4%), sales promotion (+2.0%), main media advertising (+1.9%) and direct marketing (+0.6%). However, market research remained unchanged and events showed a net reduction of -0.9%.